Swiss-Canadian multi-intrumentalist, Kalyan Mitto, shares his insights and love for music on a summer day in Corfu. I pick up Kalyan at the Corfu Buddha Hall where we had just enjoyed the singing group with Deva Premal and Miten, and head to my favourite coffee shop with the view over the beach of Arillas to one side and that of Agios Stefanos to the other. The wind blows the awnings and shifts the shadows of the sun on our table. I first met Kalyan in 1981 when the Pune Ashram had just closed and the Osho commune in Zurich started expanding at a supersonic rate, taking up all the flats, even his, of the four-storey house at Limmatstrasse 123. However, I do not remember him as a musician at that time. “I was always in our commune band — mostly playing bass or learning to play those instruments which were missing in our band…” he puts me right. Kalyan’s music studies started at the early age of seven, with the recorder; then he studied the cello from ages eight to seventeen. The way music, and in particular classical music, was taught drove him to desperation. It felt like being in a straightjacket. Then one day he locked his cello in a cupboard, dropped out of school, bought himself a guitar and, despite the loud protests of his parents, went to work on a farm for a year. He eventually agreed to finish his studies and take his baccalaureate on the condition that he could have his own flat. At the age of twenty-two, he travelled to Pune in India and became inspired by the mystic, Osho. He says he feels very lucky to have met Osho at this time because he was desperately longing for a new direction in his life. In 1987 he left his tedious job at a bank, pocketed his savings and moved to Pune. 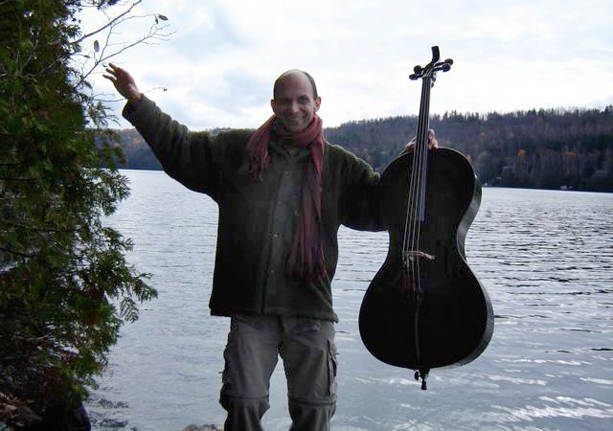 He studied psychic massage with Sagarpriya DeLong Miller, and played the bass in Buddha Hall. At that time, Osho’s Ashram attracted a large community of musicians from all over the world. Music played an important role throughout the commune activities. It was an ideal climate for musical exchange and learning. Kalyan says, “One day I decided that music was going to be my future, whatever the cost. I felt that music, for me, was inescapable! Kalyan continues: “The way I play is that I allow myself to be empty first, no thinking, like sitting in front of a tabula rasa. I become just a presence, utterly sensitive, connected, just listening – and in the playing I give myself total freedom (any scale, anything is possible). It is as if the emerging music has little to do with me. It is fascinating to see when a higher intelligence takes over, an intelligence with tremendous clarity. I try to integrate this also in my day-to-day life. But to sit in front of a hundred people, not knowing what I will play next, is scary. Yes, it is scary! One feels like a tightrope walker; the void is just beneath! While playing for the evening meditation with Kalyan the other night, I noticed that he was carefully listening to the sound of my seed-pods, feeling their rhythm and the little accents I gave them. As a percussionist I always felt that I was just filling in the gaps — like adding spice to the music here and there. I had never before experienced the feeling that I was making a contribution to which the solo instrument wanted to tune into. I felt happy discovering this. I was also surprised that Kalyan had sung during the Evening Meditation, so I asked him when he had discovered his voice. When Punam, a singer and pianist with whom he spent seven years together, came into his life, they created two CDs. And more singing opportunities arose, so much so that for the last six years – by popular request – he has been organising Singing Celebrations at his studio in Quebec and in the surrounding community. Kalyan pulls out a CD from his bag and puts it on the table. It is his masterpiece: ‘Soulweaver’– produced by Malimba Records. This CD won the first prize in ‘Visionary Awards 2006’ in the USA for Best CD of the year and best CD in the “special” category. (www.covr.net). After dropping Kalyan off and arriving back home, I switch on my keyboard, punch those knobs I had never dared to, and play “One Breath” with the rhythm of the samba. “I am allowed to do what I want! I can even change the words and the notes. So much freedom!” Thank you, Kalyan. Talking to you has been such a great gift for me.